I just finished the first two weeks of a four-week elementary school residency–my first teaching artist experience through Young Audiences. 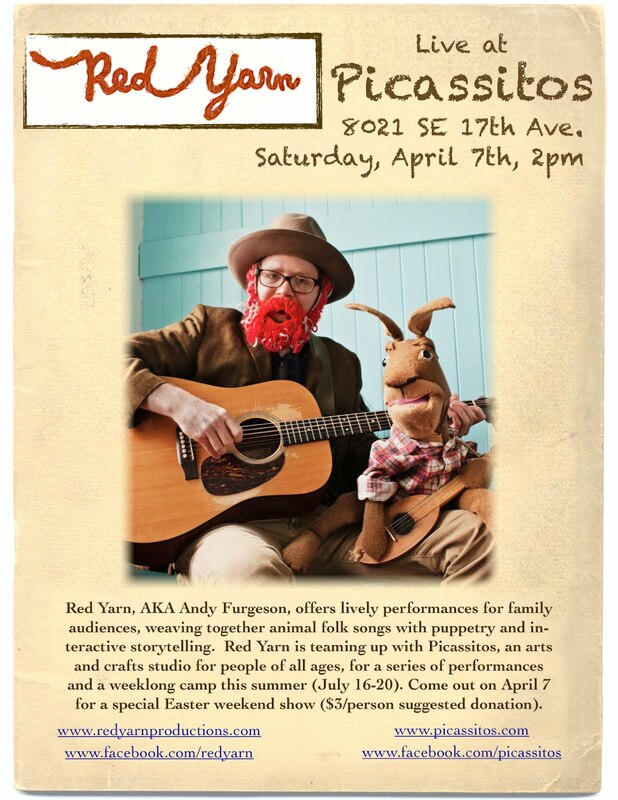 My residency is called “Folk Song Puppet Show,” so each class is learning an old animal folk song, creating elaborate sock puppets of the song’s characters, and performing for other classes on the final day. I’m working with 10 Pre-K through 3rd grade classes at Vernon Elementary, visiting each group three times. The first two weeks were a blast! 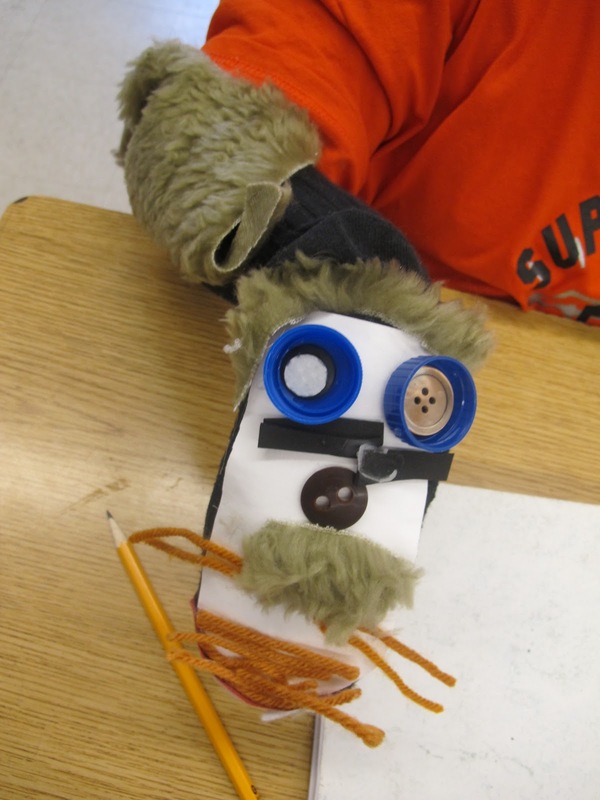 The students created hilarious, expressive, beautiful puppets and put so much energy into singing and performing the songs. I’m posting a few pictures of the puppets here, but you can find a full photo album on my Facebook page. http://redyarnproductions.com/wp-content/uploads/2016/04/bright-red-logo-for-web1.jpg 0 0 Red Yarn http://redyarnproductions.com/wp-content/uploads/2016/04/bright-red-logo-for-web1.jpg Red Yarn2012-04-30 09:30:002012-04-30 09:30:00My first school residency! This Saturday, April 7, at 2:00pm, I’m performing at Picassitos, a wonderful family arts & crafts studio in Sellwood. This is the first of a series of perfomances promoting a summer camp I’m co-leading at Picassitos from July 16-20. 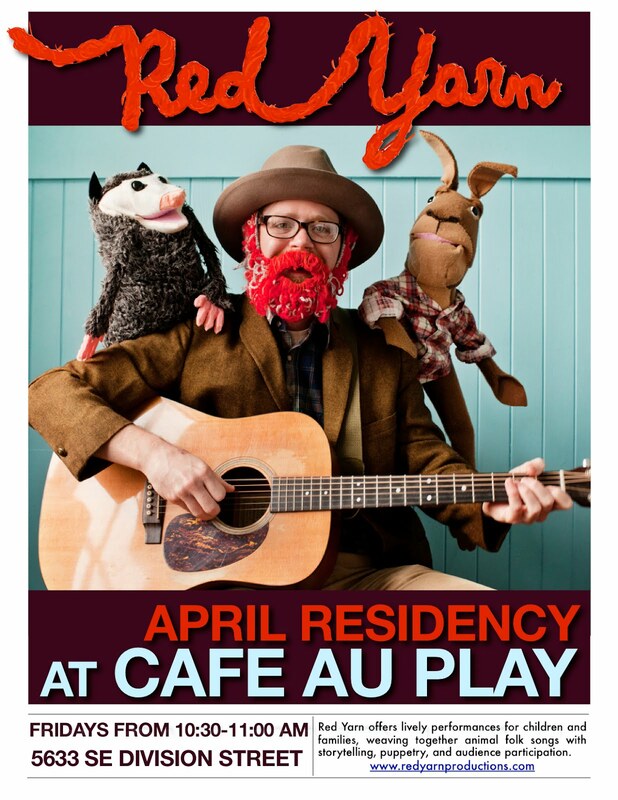 I’ll also be performing at Cafe au Play each Friday in April from 10:30-11:00am. 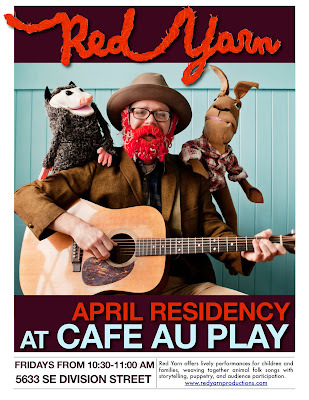 My November and February residencies at Cafe au Play were tons of fun, and this month should be just as awesome. http://redyarnproductions.com/wp-content/uploads/2016/04/bright-red-logo-for-web1.jpg 0 0 Red Yarn http://redyarnproductions.com/wp-content/uploads/2016/04/bright-red-logo-for-web1.jpg Red Yarn2012-04-03 20:54:002012-04-03 20:54:00Upcoming shows!